Far away from the streams of waste associated with traditional manufacturing there is something Prof Richard Hague refers to as Nirvana. While his idea of a transcendental experience may be very different to others, Hague sees additive manufacturing–a concept that builds up parts in 3D with hardly any scrap–as close as one can get to achieving a perfect state of bliss. 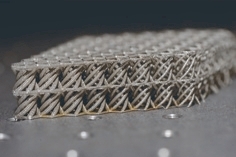 Additive machines, which use a range of laser-based or advanced printing techniques, stack one layer of material–typically polymer or metal powders–on top of each other to create a range of complex structures that are lightweight and use much less material. This is compared to traditional techniques like machining which carve parts out of solid blocks and waste up to 95 per cent material. Many of additive manufacturing’s advantages are fairly obvious, says Hague, who is head of Loughborough University’s world-leading Additive Manufacturing Research Group. Yet one aspect that no one ever proved was whether the lightweight, complex components additive manufacturing produced with less material were actually ‘greener’ than the simpler, heavier parts that were machined. So a few years ago Hague and his Loughborough colleagues Dr Chris Tuck, Dr Ian Ashcroft and Dr Ricky Wildman set out to form a consortium that would perform the arduous task of producing a true carbon analysis lifecycle of an additive manufactured product. If the team were able to prove additive manufacturing could produce low carbon products, the next step would be to address the challenges that could help push the technology further into the manufacturing mainstream. It turns out this wasn’t just some academic curiousity. With hardly any coaxing major industry partners including include Boeing, Virgin Atlantic and Bentley Motors, among others, signed up to join the Loughborough team. The project, which they light-heartedly dubbed ATKINS to reflect its low carbon or ‘low carb’ focus, received £2.7m from the Technology Strategy Board in 2008. The project is expected to run until April 2012 after receiving a one year extension. ATKINS partner MTT Technologies, a UK supplier of rapid manufacturing equipment, provided the team with a Selective Laser Melting (SLM) machine to manufacture metallic components for the automotive and aerospace sector. An SLM machine deposits layers of powder typically 50 microns thick and uses a laser to melt the cross section together. The process repeats layer by layer until the component is built. Hague said they originally intended to build components from both polymer and metal powders, but the former was dropped when it was feared an environmental case could not be made. In order to demonstrate actual carbon savings, the ATKINS team took into consideration everything from design and manufacture of the component to distribution and the ‘in use’ phase. 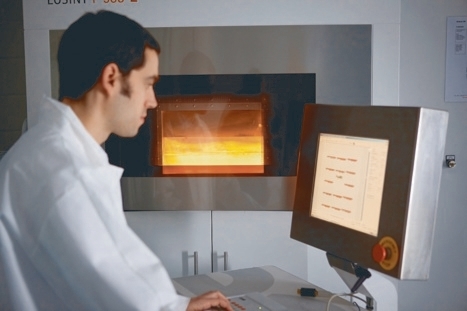 ‘Until the ATKINS project nobody had ever put energy monitoring equipment onto an additive manufacturing machine,’ said Dr Phil Reeves, managing director of Econolyst Ltd, a Derbyshire-based rapid manufacturing consultancy. Econolyst, a partner in the ATKINS project, worked with Nottinghamshire-based Kinetic ICT to develop a web-based software capable of calculating the carbon output of each step in the supply chain. 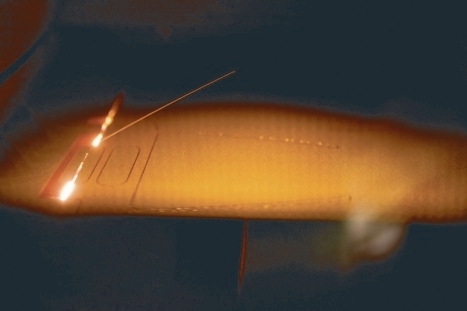 The program dubbed Enlighten will be commercially launched in April 2011. Reeves explained the software compares the carbon footprint of a component built by additive manufacturing to one made by machining or injection moulding. Although it can be set to analyse any kind of manufacturing process. Backed by scrolls of data from government and academic sources worldwide, the software automatically changes the carbon footprint of a component depending on the manufacturing process, raw material, location of manufacture or mode of transportation for distribution, he said. It can even tell what the carbon footprint of a product would be if a manufacturer switches electricity suppliers. Hague said the ATKINS team found, to some surprise, additive manufacturing did not always have the lowest carbon output in every step of the supply chain. Additive manufacturing can make parts up to 50 per cent lighter than what is possible with machining and this, as partners like Virgin Atlantic know, can have a significant affect on the bottom line. These sort of figures have not been overlooked by the aerospace industry. Indeed, despite its conservatism, it has a relatively long history of embracing additive processes. ATKINS partner Boeing began putting laser-sintered cooling ducting on its F18 fighter jets around 10 years ago and the 787 Dreamliner also features a number of non-critical laser-sintered components. Boeing’s participation in ATKINS has allowed project partners to access one of the world’s most developed and advanced users of additive manufacturing. Hague said the ATKINS team are currently working on optimising components like brackets– the titanium components that bolt aeroplanes together–for Boeing. For Virgin Atlantic, Hague said the team is looking at using SLM manufactured parts to lower the weight of passenger seats. Bentley Motors has similar aspirations for their notoriously heavy vehicles. The carmaker joined ATKINS with hopes SLM produced components could help their luxury automobiles stay in line with increasingly strict emissions regulations. Automotive parts manufacturers Alcon Components and Delphi Diesel Systems, which are both members of the ATKINS team, claimed they are already impressed by the design freedom SLM has given them for their brake callipers and diesel pumps respectively. As to the overall carbon footprint of an SLM produced component, Reeves said Econolyst’s software showed the carbon savings made while the products are in-use more than makes up for the energy required to produce them. The figures were most dramatic for aerospace components, he said, which have carbon savings equalling ‘three to four orders of magnitude more’ than the amount of C02 emitted to make them. In the end, Hague said the numbers don’t lie: additive manufacturing creates low carbon products. Only not in the way most people would think. The challenge now for the Loughborough team will be to further optimise components and improve the repeatability and reliability of additive manufacturing technology so it is ready to handle the demands of industry on an international scale. After six years heading Loughborough’s Additive Manufacturing Research Group, Hague said ATKINS could be considered the most important work he has done to date. ‘It’s very much the best project I have ever done,’ he said. Welding typically creates distortion in the welded structure and mitigating this can add to the cost of any manufacturing process. The MALCO project has sought to address this issue by developing so-called ’low-stress no-distortion’ (LSND) welding methods that could lead to shorter manufacturing times and reduce cost across a range of industries. This project has developed a sophisticated method for dissipating heat generated in small electronic devices. 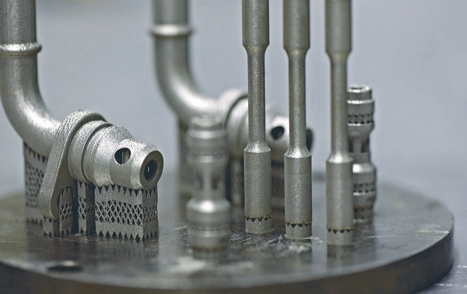 The Lost Carbonate Sintering (LCS) process manufactures micro-porous metals for lighter, more efficient heat exchangers. LCS porous metals could be used as lightweight heat sinks, heat pipes and active cooling devices in electronics, defence, aerospace and automotive industries.